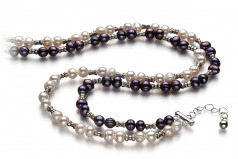 Each necklace is individually designed with various shapes, lustre and body of white or black pearls with alternating pieces of stunning sterling silver beads separating the pearls. 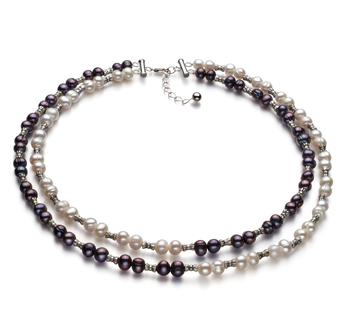 These separating sterling silver beads are set in between several black pearls on one strand or white pearls on the opposite strand. The style and elegance of the overall look and design is simply breathtaking and unique. The (AA) lustre is just enough to bounce the sparkle off the sterling silver and pearls to create a display of radiating fireworks. This necklace is secured with a brass double round clasp.